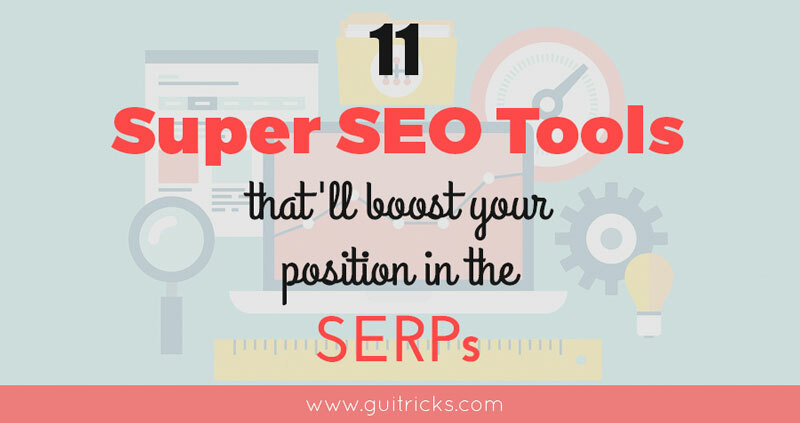 11 Super SEO Tools That'll Boost Your Position in the SERPs | GUI Tricks - In Touch With Tomorrow! 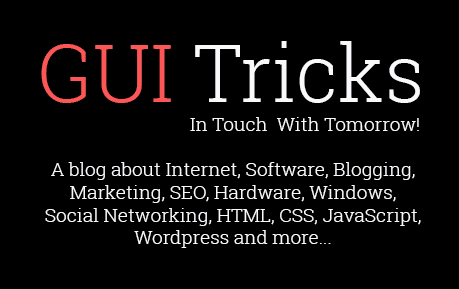 11 Super SEO Tools That'll Boost Your Position in the SERPs - GUI Tricks - In Touch With Tomorrow! Climbing up the SERPs will definitely require a lot of time and work. Actions like keyword research and content creation are vital if you wish to boost your growth. The good news is that you don’t have to do everything by hand. We have gathered a list of useful SEO tools that will surely help you throughout the ranking process by giving you the opportunity to boost your content marketing endeavors. If you truly wish to get your blog to a higher rank, learning how to use Google Analytics is a must. If you do not already know, Google Analytics is one of the most in-depth tools which provides you with everything you need, from metrics to traffic sources and visitors’ locations. With the help of this tool you will easily find out what works and what doesn’t. Creating links on well-recognized sites in your niche will definitely boost your rankings. Or at least, ask popular influencers in your niche to offer you a quote. With the help of AuthoritySpy you will easily find the top influencers in your niche. Making it easier for you to contact them and start collaborating with them. Owning valuable content is crucial these days. That’s because Google is ranking your page depending on the quality of your content. So, asking writing services to help you craft a better and more original content is not such a bad idea. If you are encountering difficulties writing or editing your content or you just don’t have enough time to do it, rest assured, this is why such services exists. Google created this amazing tool so you may get the chance of finding the right keywords, while helping you chose the finest ones for your AdWords campaign. Keyword planner can be used to analyze the keywords used by your competitors on their landing pages. Most SEO experts adore working with MozBar. The following tool is usually used to boost your ranking. It works like this: when entering a keyword search, it will show stats like domain authority and page authority. These stats will help you gain valuable insights regarding your competition, and it can also show you the difficulty score for each keyword you enter. Through the help of this amazing tool designed by Neil Patel, you will easily get extensive insights when browsing a site. You will get details regarding the loading speed, keywords, and social media. More than just that, you will get a comparative analysis feature that will let you know where you stand compared to your competition. There are times when your best option is to peek into your competitor’s strategies. SEMrush is the perfect tool that can provide you with all the details regarding the keywords used by your competition for targeting. By having all these insights, you will be one step forward compared to your competition. Ranking for popular keywords might be a little bit complicated because you might run into some aggressive competition. Nevertheless, there are long-tail keywords that can be taped into much more easily. Google can help you do this as well, but Übersuggest will do it much quicker and even provide you with some great content ideas. Ahrefs is the perfect tool that can help you build backlinks. When you’re using Ahrefs to analyze a particular website, it will show you everything you need to know, such as the number of backlinks, and their growth over a certain period of time. This tool may be used to carry out a link audit, or, you might simply use it to find broken links. If you are looking for a complete website analyzer, you found it. Woorank can generate detailed reports in a short time and include all data on 404 errors, robots.txt, geo data, or favicons. When it comes to social media, you’ll have a hard time finding a more effective tool than Woorank. It can gather infinite amounts of data from social media platforms. Besides all these, this tool is perfect for mobile optimization as well. Dibz is a great tool that will help you build links, quicker and more efficient than ever before. With the aid of this tool, you will get the chance of finding the best websites that accept guest posts. In this way, your marketing campaign will get an extra boost. Growing your blog’s ranking on Google will definitely take a while, but with these amazing tools that we just presented to you, you will get the opportunity of reducing the time needed in order to skyrocket your blog’s position. Brenda Savoie is a content marketer at SuperiorPapers, private English tutor, and desperate dreamer. Writing her first romance novel. Seeking contentment through mindfulness. Check her blog BestwritingClues.